Operation Conversation: Cops and Kids program participants: Sarell Ahart, Patrick Weller, Gabrielle L. Kurlander, President and CEO, All Stars Project (ASP); Chief Philip Banks, Community Affairs, New York Police Department (NYPD); Lenora Fulani, Ph.D., Co-founder, ASP, and Director, Operation Conversation: Cops and Kids; Cheyenne Davis, and Melquan Gass. NEW YORK, NY - The All Stars Project, Inc. hosted its 10th Annual Benefit Luncheon to support its afterschool leadership training program, the Joseph A. Forgione Development School for Youth, on Friday, December 2, at the New York Hilton. 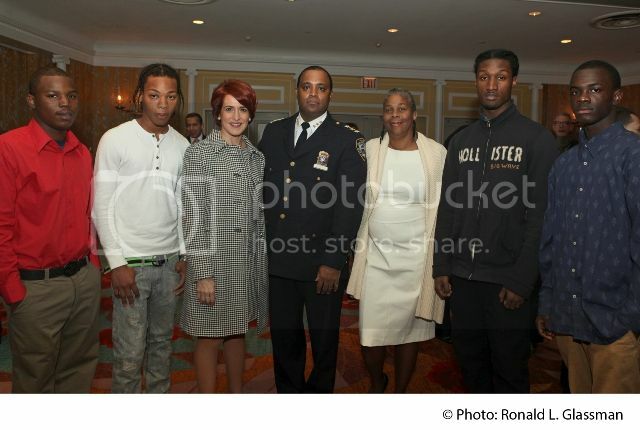 At the event, the Project saluted its partnership with the New York City Police Department (NYPD) and Operation Conversation: Cops and Kids, which uses performance and improvisation to foster positive relationships between police officers and inner-city youth. After the success of 50 pilot workshop sessions involving over 500 police officers and 750 young people, Operation Conversation: Cops and Kids is now a program that has been used throughout NYC. The program was created by All Stars co-founders Lenora Fulani, Ph.D. and the late Fred Newman Ph.D. in response to the death of Sean Bell in 2006. Chief Philip Banks of the NYPD's Community Affairs Department was a special guest speaker at the All Stars benefit luncheon and stated, "The training that Operation Conversation: Cops and Kids is providing to police officers is invaluable... it's simple, it works, and it's effective." The luncheon honored FTI Consulting and Edward Reilly, Global CEO – Strategic Communications and raised $450,000. It was attended by 250 executives from Fortune 500 corporations and financial firms across the New York region. Bill Weir, ABC News “Nightline” co-anchor hosted the event. The New York Urban League's (NYUL) Annual Meeting hosts panel discussion, "Law & Disorder: Developing Partnerships for Peace," that was moderated by WNBC's DeMarco Morgan (far left). Panelists included (left to right), Blake Tirado and L'Eunice Faust of the Harlem Youth Council; Arva Rice, NYUL; Iesha Sekou, Street Corner Resources; and Philip Banks, III, NYPD. 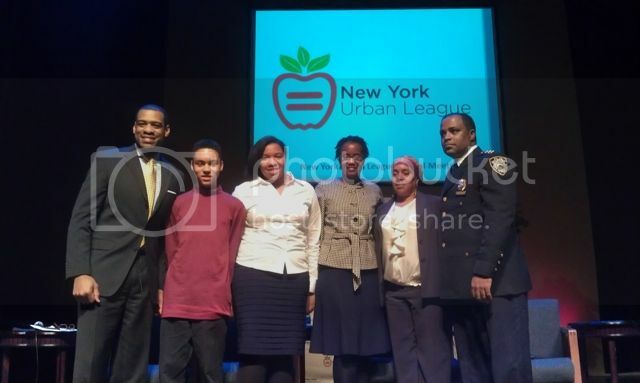 On December 1st, Harlem residents, public safety officials and local nonprofits came together for the New York Urban League (NYUL) Annual Meeting, Law and Disorder: Developing Partnerships for Peace. Earlier this year, NYUL called upon leadership from the city and the Harlem community for Harlem Dialogues, a half-day think tank focused on how to restore safety to the neighborhoods plagued with violence. The conversation continued at this year's annual meeting held at the Schomburg Center for Research in Black Culture with a panel discussion led by WNBC News Anchor, DeMarco Morgan, which included NYPD Chief of Community Affairs, Philip Banks, III; Iesha Sekou, Founder and Executive Director of Street Corner Resources; Harlem Youth Council participants L'Eunice Faust and Blake Tirado; and Arva Rice, President and CEO of the New York Urban League. In preparation for the annual meeting, hundreds of Harlem residents participated in an online survey focused on community safety. Findings from the survey showed that the community believes the three leading root causes of crime and violence in communities are the prevalence of guns, gang activity, and a lack of positive activities for youth. Respondents also recommended more police presence, more positive activities for teens, and jobs for adults as needed actions to reduce crime. The evening also served as an introduction of the NYUL Harlem Youth Council, created as a result of feedback from the Harlem Dialogues. The council is comprised of young adults from more than 10 youth agencies who will work closely with NYUL to provide a younger perspective on the issues they face and the viability of solutions to community violence. L'Eunice Faust, age 16 shared, "Most teens are not aware of the positive programs that exist and many turn to gangs to be a part of something." 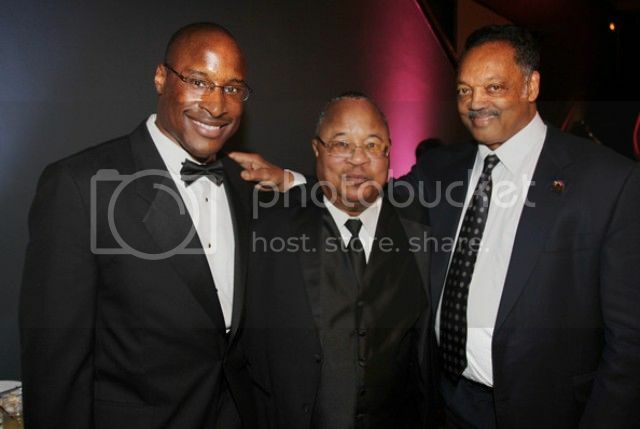 Afam Onyema, CEO, GEANCO Foundation; Dr. Godwin Onyema and the Reverend Jesse Jackson attend the GEANCO Foundation's Health and Hope for Africa Concert Gala in Chicago. CHICAGO, IL - The GEANCO Foundation, an organization whose mission is to save and improve the lives of Africa's most vulnerable and impoverished citizens, held its first corporate sponsored Chicago fundraiser, the Health and Hope for Africa Concert Gala on Saturday, December 3, 2011. The hugely successful event was held at the iconic Museum of Science and Industry and drew the support of several illustrious celebrities and prominent leaders from Chicago's political community. Amobi Okoye of the Chicago Bears co-chaired and hosted the evening, and American Idol's Syesha Mercado, fresh off of starring roles in the movie Dreams and the national Broadway tour of Dreamgirls, provided a powerful yet intimate performance. Among the guests in attendance were Illinois Governor Pat Quinn, Representative Jesse Jackson, Jr. and Cook County Board President Toni Preckwinkle along with top executives from AON/Hewitt, Ariel Investments, Ernst & Young, Discover Financial Services and General Growth Properties. The gala raised $60,000, which will be used to fund future medical missions to Nigeria and the building of Augustine Memorial Hospital in Anambra State. 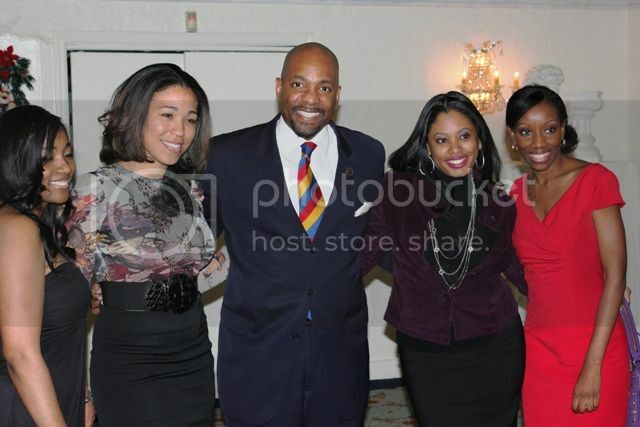 Tara Dowdell (far right), Tara Dowdell Group; Newark City Councilman Ron C. Rice, honorary event chair, (center) and guests attend the 3rd Annual "Children Are A Gift" benefit in Orange, New Jersey. On Wednesday November 30th, Tara Dowdell, President of the Tara Dowdell Group and progressive television commentator, hosted the Project Re-Direct’s Third Annual “Children Are A Gift” Networking Benefit. David Webb, Sirus XM radio host and television commentator, lent his talents as emcee for the event, that was held at The Appian Way restaurant in Orange, NJ. Funds raised benefited Project Re-Direct’s educational programs that serve to uplift and educate at risk youth. Among the event honorees were Newark City Council President, Donald Payne, Jr.; Newark Public Schools Advisory Board Member, Shavar Jeffries; Chief of Staff for Mayor Cory Booker, Modia Butler; UNCF (NJ) President, Anthony Caldwell; Accounting Alternatives Executive, Mike DiBianco; Jessica Ballew of Investors Savings Bank and Newark Now Executive Director, Lavar Young. Honorary event chairs were Irvington, New Jersey Mayor Wayne Smith and Newark City Councilman Ron C. Rice.